My Little Pony is a brand that’s been around for a while – in fact, the My Little Pony 35th Anniversary was in 2016 – and it has been popular for generations among little girls all over the world. If you have a young lady in your life that you’d like to buy My Little Pony toys for, it’s a good idea to get acquainted with what’s out there so you can make the best choice for her. When it comes to pony toys, there are also lots of knockoffs out there and they don’t carry the same quality as the brand name MLP toys. Keep reading for some of the best offerings, and get ready to see your little girl’s face light up. 1.11 What are the Benefits of Playing with Toy Ponies? 1.12 How do I Look After My Little Pony Toys? 1.13 What are the Differences Between the Original My Little Pony and the New Versions? One of the primary things to think about when buying toys, including My Little Pony dolls is if they are age appropriate. Small pieces pose a choking hazard to very young girls and those that are a bit older might not enjoy playing with dolls or ponies anymore. Make sure you choose a pony that suits the age and interests of the girl you’re buying for. Many parents don’t enjoy having toys that make a lot of noise so keep that in mind when you select the ponies as well. It’s best to stick to brand name My Little Pony toys because their quality is regulated and you can be sure they are safe for kids to play with. Before making a purchase, it’s also a good idea to check and see if the toy has been recalled or if it gets good or bad reviews. Overall, be sure the toy is safe for the child you’re buying for and that they are going to enjoy playing with it. This Princess Celestia toy is great for children who love playing with plush toys. With its adorable horn, shiny wings and crown, any child who loves princesses and unicorns will adore playing with this horse. In fact, this My Little Pony unicorn is one of the most popular choices for the younger set. This My Little Pony plush comes from the creators of Beanie Babies so you know it’s soft and put together well. At 3.2 ounces, the pony is lightweight and easy to take on the go and it’s iconic multicolored hair is fun to brush and style. It’s a great gift and is sure to make any child happy. This pony is best suited for children ages 3 and up. This My Little Pony set is great for children ages 3 and up as it has some small parts that make it dangerous for younger kids. 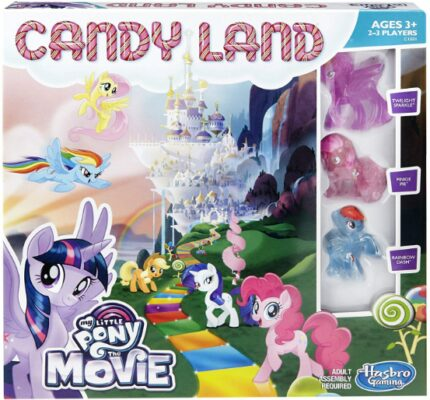 The set includes Princess Celestia and 13 accessories for hours of playtime fun acting out the Canterlot stories. There are only two figures so you’ll have to round out the set with additional ponies to allow for acting out the story with all the characters. The set is part of the My Little Pony Equestria girls dolls and is made from sturdy plastic in fun, bright colors. The set works well with figures that are 1.5 to 2 inches and is too small to accommodate the larger figures. 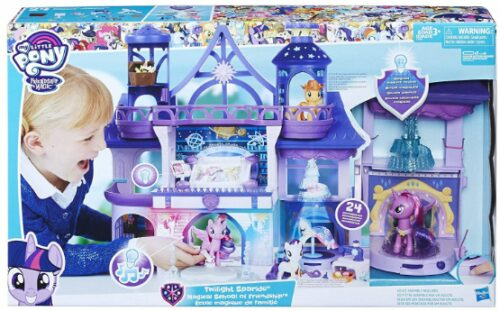 Overall, children who enjoyed the My Little Pony movie will love recreating their favorite scenes using this castle playset. If your know someone who loves some of the original My Little Pony characters, this is the toy for you. The set includes some the most popular My Little Pony dolls, including Rainbow Dash, Pinkie Pie, Fluttershy, Applejack, Rarity, and Twilight Sparkle. Each doll comes with a fun mystery accessory and is a fun gift for any occasion. The ponies are about 2 inches tall, so they aren’t as large as some of the other My Little Pony toys on the market. They’re ideal for children ages 3 and up as they are on the smaller side. Each pony has hair that can be combed and styled and are a great size for some of the smaller pony playsets. Fans of the original Pinkie Pie toy or any vintage MLP will love playing with these cute little ponies. Inspired by the movie, this My Little Pony is a fun addition to any child’s collection. The doll includes a tiara and necklace and has glittery wings and hair that can be brushed and styled. The pony is a fun way to reenact all the best Canterlot scenes and works well with many of the other ponies from the movie. The toy comes with demo batteries, but you’ll need to replace them 3 a76 alkaline batteries. Any child will love how the pony lights up and changes color, but the small accessories are easy to lose if they aren’t attached to the pony. Anyone who loves My Little Pony and board games will simply adore playing this version. When it comes to My Little Pony games, this one gets top reviews and will provide hours of entertainment for kids of many ages, though it’s best for kids ages 3 and up since it has some small pieces. Unlike the original, this one only allows for three players and has 44 cards, which means you may have to reshuffle to finish the game. The game is based on the movie and features scenes and characters from Canterlot, including the Rainbow Bridge, Storm King, and Tempest Shadow. This lightweight game is great for road trips and travel and is a fun addition to any My Little Pony collection. Magic and friendship abound in this fun playset that features Twilight Sparkle and Zecora in a fun library setting. Ideal for kids ages 3-11, the set is a fun way to spark your child’s imagination and have some fun at the same time. The characters come with several accessories so you can dress them and several additional accessories to help create a variety of scenes. The set is a spooky themed one, which may not be suitable for very young children. However, it gets high ratings and is a great gift idea. This My Little Pony playset is a fun way to recreate trick or treating fun, but also allows for all kinds of stories that take place in a magical treehouse with an owl for a friend. 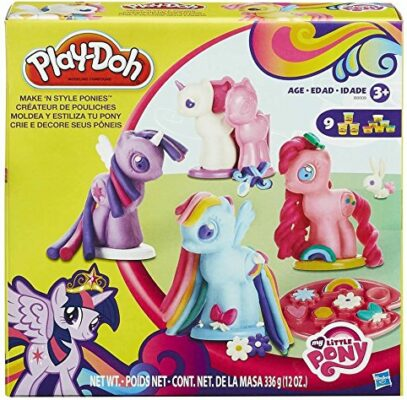 This My Little Pony maker is great for clay fans and comes from the makers of all the best Play Doh toys. It features four molds – Pegasus, Earth, Princesses, and Unicorns and comes with 9 fun colors that are sure to get any child’s creative juices flowing. The set allows you to make cutie marks, manes and tails for hours of enjoyment. The set is great for making some of the most popular ponies from the cartoons. However, the tubs of Play Doh are mini, which means there might not be enough to fill the molds completely, though they work well with larger tubs of Play Doh. The toy is not recommended for children under age 3 as it poses a choking risk. Overall, the toy is fun, but may require larger amounts of Play Doh to achieve the desired result. If you’re looking for a playset from the My Little Pony maker, this one is a fun choice. The set boasts a large castle with three tiers in a fun blue, purple and white color scheme. It has a lever activated elevator and a variety of accessories to go along with the theme, which comes from season 8 of the Friendship is Magic television show. The set works for the 3-inch ponies, but not very well for the larger ones. It comes with a Twilight Sparkle pony, who can be the school’s teacher or student and inspires many hours of creative play. The set requires some assembly so it must be put together before it can be played with. There are many small pieces so it’s not safe for children under age 3. These My Little Pony Equestria Girls Minis are a neat way to get the fun started. The characters come from the Friendship is Magic collection and include characters such as Rainbow Dash, Pinkie Pie, Applejack, and Princess Celestia. Each of the 10 My Little Pony figures is about 4 to 6 inches tall and there are also several accessories includes. The ponies are great for adding to playsets to create favorite scenes from the My Little Pony Movie or television show. Soft hair is ideal for brushing and braiding and the set is a great gift idea for any child aged 3 or above. Music lovers will get a big kick out of this Rainbow Dash doll that sings and allows you to sing along in duet mode. With 5 songs, the toy is a fun way to get kids singing and dancing. You can use the microphone to sing alone as well and the pony also says 15 phrases to keep the fun going. The pony has a pair of sunglasses that she can wear on her face or pushed up on her head. This Rainbow Dash toy can be played with alone or as part of any of the My Little Pony playsets. The toy takes batteries, which are included, but may wear out quickly if the toy is left turned on or is played with heavily. What are the Benefits of Playing with Toy Ponies? One of the best things about toys like My Little Ponies is that they foster imagination and get a child thinking and creating stories of his or her own on a regular basis. This creativity is vital for healthy development and is also a fun way to keep kids entertained at home or away. They toys are simple, which means they are easy to enjoy without a lot of parental assembly or involvement and if a child also watches the movies and television show, he or she learns a lot about being a good friend and making good choices. But the primary reason to buy your child MLP toys is that they are fun and all children deserve toys that they enjoy playing with. How do I Look After My Little Pony Toys? Fortunately, taking care of your ponies is fairly easy. Because many of the sets have small pieces, it’s a good idea to have a container or box to store them in when your child isn’t playing with them so they don’t get lost or broken. The plastic ponies and playsets can be wiped with a damp cloth to keep them clean. Be sure that batteries are changed as necessary and that the ponies are left out in the sun or immersed in water. It’s easy to keep the ponies looking great so they can be played with for many years to come. What are the Differences Between the Original My Little Pony and the New Versions? The original My Little Ponies are many years old and bear just a small resemblance to the newer ones on the market today. The modern My Little Pony has much larger eyes and a smaller snout. While both versions are based on a television show, the newer Friendship Magic show is an Internet sensation. There are many more characters now than in the past and the playsets are much more diverse. While the older ponies were played with by basically brushing and styling the hair and making up scenes, the newer ones come with more accessories and playsets that come straight from the cartoon or movie so favorite scenes can be recreated right at home. Despite the differences, both versions are very popular and are fun for kids ages 3 and up. The Ultimate Equestria Collection seems to be the best choice. It has more ponies than the other sets in a variety of sizes. The hair is soft and easy to play with and the ponies can be played with on their own or in any of the playsets that accommodate their larger size. The creative opportunities are endless and the set appeals to those who love the original MLP series as well as those who favor the newer versions.